Confession: I kind of detest Skype dates. I love keeping in touch with long distance friends. Of course I do. But my goodness do I hate Skype dates. So I asked myself, what is it about Skype that I dread so much? 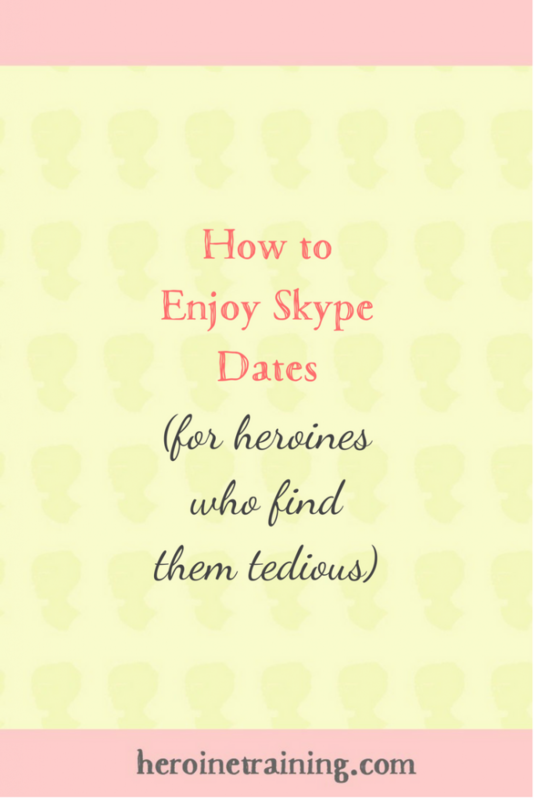 I decided to tackle this hurdle once and for all, by acknowledging everything I dislike about Skype dates, and addressing them one by one. PROBLEM: I don’t want to stare at a screen. I spend more than enough time on the computer as it is. SOLUTION: Turn off video, or make it full screen. Just because I can use a tech tool, doesn’t mean I need to. When my eyes are tired, or I’m feeling extra distract-able, I don’t use video. When I do use video, I make the application full screen and position my hands away from the keyboard for once. PROBLEM: Skype catch-ups take too long. I may have a blast, but then I go, great scot, look at the time, we’ve been here nearly four hours!, and get all grumpy for pushing forward my evening routine. Knowing that this tends to happen, I am less likely to schedule a chat in the first place, and more likely to cancel. SOLUTION: A 30-minute time limit. 30 minutes is my personal limit for an online chat, compact as a cup of tea. I’d rather chat for 30 minutes once a month than for three hours a couple times a year. I’ll give my undivided attention for that half hour: no tabs up or laundry folding or multitasking of any kind. ‘Weird, it’s working now! I don’t know what it was’. THE SOLUTION: Address swiftly and move on. Consciously reduce technical small talk, the online version of commenting on the weather. There’s the inevitable, ‘Can you do this time? How about this time?’ Especially if they’re in the dreadfully inconvenient – gasp – pacific standard time. THE SOLUTION: I started a personal Calendly. This appointment-arranging tool is free if you have just one type of calendar. I input my availability, it converts the time zones for me, and eliminates the back and forth. THE PROBLEM: Skype dates coop me up. I fear that planning my day around a digital date will keep me from living life in the real world. THE SOLUTION: Two available time slots only. 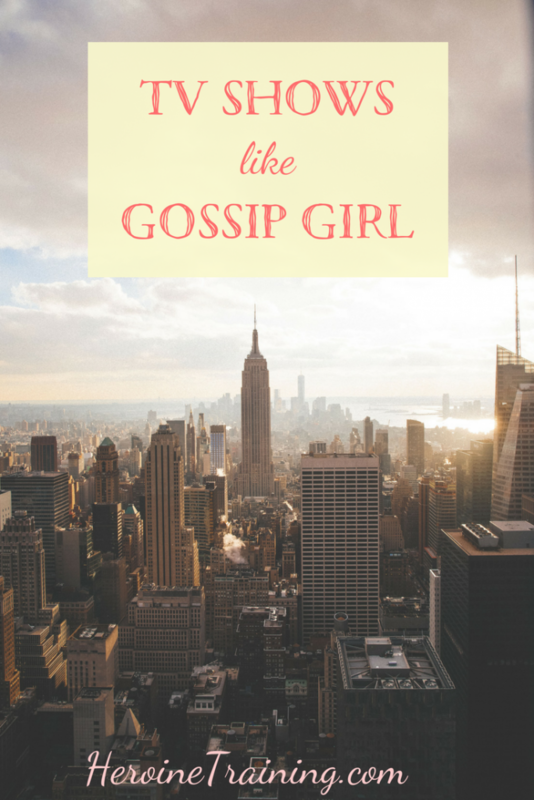 Monday afternoons:As I start my week, I tend to be too busy to meet people in person anyway. Tuesday evenings: On ‘Steve’s night out’ I encourage him to meet up with friends and pursue his personal hobbies. I stay home with the puppy. This opens up a more convenient slot for west coasters, and doesn’t impede on family time. The occasional weekend: If Steve is away, I add extra dates to accommodate more time zones and work schedules. Voxer: This Kim Possible-worthy walkie talkie app lets you send voice memos back and forth (Messenger does too, but cuts you off at a minute). My creativity partner Scott and I trade voice memos across inconvenient time zones. I like to to listen and respond while I’m walking, carrying little conversations around in my pocket. Send a video: Instead of typing out a paragraph, I’ll send a short video on Messenger or Instagram. Write a letter. I carry letters and extra stationery in my planner. At lunch or on a pomodoro break I’ll write a letter. Write a postcard. I keep a box of postcards by my bedside table, and if I feel the urge to text someone, I write a postcard instead. Even if they live around the corner, even if I will see them tomorrow. In an ideal world, I would return to the corded phone. As old and as cute as possible please. We all have our grumpy moods. Cranky Xandra = Lorelai Gilmore without coffee. Cranky Steve = Teenage Groot. Now Gilmore girls and Guardians of the Galaxy are great, but what is Heroine Training without an extended Harry Potter metaphor? When we get in our grumpy moods, what’s really happening is that we’re carrying a Horcrux. In Harry Potter and the Deathly Hallows, Harry, Ron, and Hermione are confined to a magic tent in various hideouts, on the run from the Death Eaters, under the constant pressure to hunt down Horcruxes, fragments of Voldemort’s soul contained in various objects. What I love about this prolonged camping sequence is that the war is not all action all the time. The trio spend much of the time frustrated with one another, in close quarters with limited food and a lack of progress. They are tortured by sitting still, not knowing what’s going on. There’s nothing overtly heroic about this part of the battle. On top of all this, they have a Horcrux necklace to babysit before they figure out how to destroy it. When one of them gets in a mood, it’s often because it’s their turn to carry the necklace: a sort of One Ring to Rule Them All situation, a burden that must be shared, or its power will overcome the bearer with ULTIMATE ANGST. We have a replica of this necklace at home. When I was 16, I took a fantasy literature class at an Oxford summer programme (And while I was there, Deathly Hallows came out). When I was 21, I worked on the same programme as an assistant, and to my delight, the kids were still into Harry Potter. So of course I had to start a Dumbledore’s Army so we could geek out together. I wrote them a pub quiz, and purchased the Horcrux necklace as a prize. They thought it best to share the burden amongst them. Obviously. They are so wise. At the end of the programme they gave the Horcrux to me. I took it home, and decided to continue their tradition. Admitting It: You’re Carrying a Horcrux. These days the Horcrux is stored safely in our flat, to be picked up and worn by Steve or me when we’re feeling particularly stressy. Or, if one of us is acting stressy, the other has every right to go get the necklace and offer it as an explanation. Yesterday for instance, Steve was grumbling at his computer, so I got up and put the necklace on the table next to him. “Yeah, alright,” he said, putting it on and continuing to type away. Being in the physical presence of a Horcrux is emotionally and physically taxing. Generally feeling grumpy and angsty is also taxing. 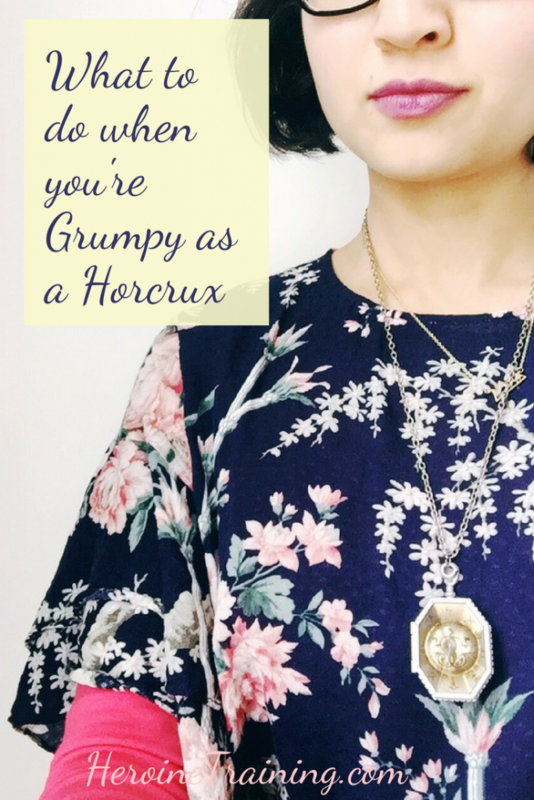 The Horcrux is a simple way to ask for extra support, and to warn others of grumpiness. Wearing the Horcrux is a reminder that this mood is not who we are. When I wear the Horcrux, I feel validated in my upset-ness. I am reminded that feeling unwell is not normal for me. It is the burden that I bear for now, not forever. When I visited the Orchard House, I learned that Louisa May Alcott’s family had a Horcrux necklace of their own in the form of a ‘Mood Pillow’. This ’sausage pillow’ sat upright, but would be turned on its side when Louisa was in one of her Jo March-like ‘moods’. A pillow, a necklace, an emoji in a text – these are all simple ways to check in with those around you when you’re too grumpy to form the words. What will your Horcrux be? P.S. The kids from the Literature and the Fantastic class all had Lord of the Rings names. Their teacher was Gandalf, and on the day I subbed for her, they deemed me Strider (definitely in my top 5 coolest achievements). They heard that Steve was coming to visit, and so he became Arwen. P.P.S. If you’re feeling like your role in the revolution right now is like an angsty camping sequence, let’s explore that together at the Rebel Heroine Retreat. 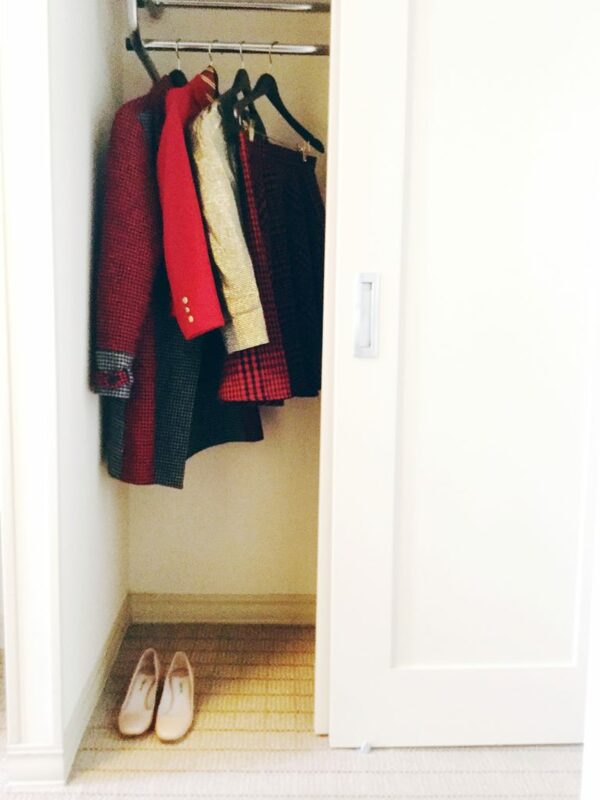 Tour my wardrobe with me! My current wardrobe situation reminds me of my clothes storage in college [the subject of my very first blog post!]. It seemed about time for an update, so here is a tour of my KonMari’d closet, containing all my clothes! This tour is filed under SLYTHERIN for promoting self confidence and personal identity through unapologetic fashion expression. One of the woes of being an international heroine is that my closest companions are scattered across the globe. Alas! Instead of bemoan the difficulties of being so cosmopolitan, I take long-distance friendships as a creative challenge. Especially as an introvert, favouring intimate connections in short bursts, a global girl gang is the way to go. At the back of my Passion Planner, I have a page headlined friends friends friends [inspired by Luna Lovegood’s bedroom wall]. I keep an orderly list, arranged by city and country, so that when I happen to be in town I can run down the list to get in touch. Much simpler than scrolling through my mental rolodex. Taylor Swift keeps black and white portraits of her besties in her hallway. I started a portable collection of black and white portraits in a folder on my iPod called Hallway. Recently I upgraded the project to a private Instagram account, posting my beloved portraits on friends’ birthdays, and when I’m thinking of them. I wanted a place to celebrate my friends privately, without unwanted exposure to the blogosphere. Maybe this is a Gryffindor thing. look how awesome my friends are!!! Keep in touch the old fashioned way. When Steve and I were living distantly, my favourite tradition was writing him a letter every Sunday. Communication through letters is uniquely intimate, something more deliberate than in-person conversation, and more thoughtful than email or text. I love writing friends letters, often on a weekend, usually on holiday, when I have time to spread out. I always seal the envelope with stickers or washi tape, and I usually enclose little trinkets, like a free postcard from the coffeeshop in which I scribed the note, or a torn page from a magazine. Can’t include such delights in an email! Another thing Steve and I did when we were apart was play Words with Friends. The sentiment was in the right place, but he complained that I took too long thinking of words. Sooo I’m taking suggestions for more suitable games. Lately I’ve been enjoying Dots & Co, which is single-player, but you can see your friends’ progress and send each other free energy. Get in touch if you’re playing too! Sometimes it feels weird to reconnect with someone I haven’t spoken to in years without a full catch up: How are you? Where are you? What have you been up to? But such pleasantries are not always necessary, in truth. 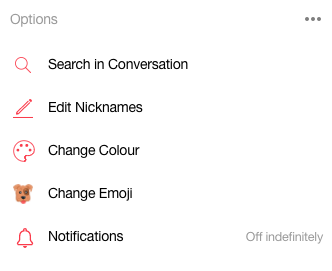 These exchanges usually happen over Facebook Messenger (because my phone doesn’t do emojis), where I enjoy pairing each contact with the perfect colour and emoji [did you know you can do this? Tap your friend’s name at the top of your screen on mobile! ], and I enjoy exchanging Stickers. All about the stickers, digital and physical. Schedule a digital Lunch Date. I started using Calendly to schedule business appointments, but I have a separate calendar just for ‘lunch dates’ with faraway friends on Skype, whether they’re also having lunch, or an east coast breakfast. 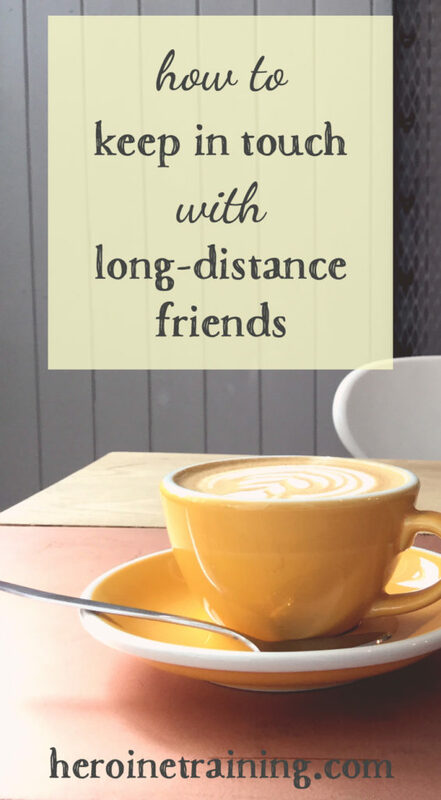 Even a half hour catch up is wonderful – I actually prefer it to a few hours every few months – and much more manageable and fun than going back and forth about time zones. The great thing about having friends around the world is that I have a marvellous excuse to visit my favourite people in new places. My preferred travel activity is to collect glimpses of my friends’ daily lives around the world. Encourage friends to visit you as well – not just ‘come any time’, but suggest a specific itinerary and time of year. Or, meet in the middle. Kat and I forgo birthday presents in exchange for the promise to meet up whenever Taylor Swift is on tour. Whether a friend lives down the street or on the other side of the planet, I like to close each gathering by gauging when we’ll next see each other. Asking the question reaffirms the intention to keep in touch, and could lead to unexpected crossings of paths! How do you keep in touch with faraway friends? P.S. I founded the Heroine Training traveling tea party tour to meet even more friends around the world. Put in a vote for your hometown, and receive a personal invitation when I’m nearby [when I say personal I mean personal!]. This lesson is filed under SLYTHERIN, the house where you “meet your real friends”.